Cassie had lunch one day at Maestro’s, and she liked it so much, she wanted to go back the next day and try out their restaurant week menu. 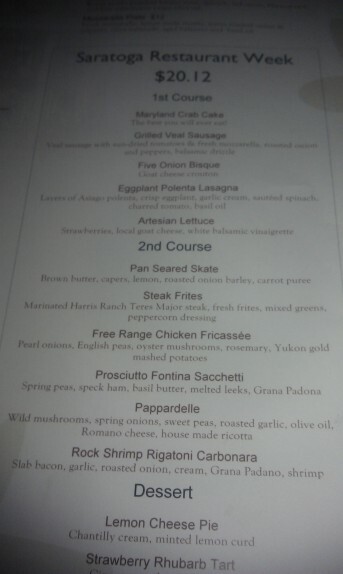 Three courses for $20.12 certainly sparked my curiosity. This was all very spur of the moment within a day, so I had Cassie try to get reservations. We could only get reservations for 8:45PM or later. So we made the trip on that Friday evening, and, after the usual Friday evening Saratoga quest to find parking, we walked a few short blocks in the unseasonably warm spring air. 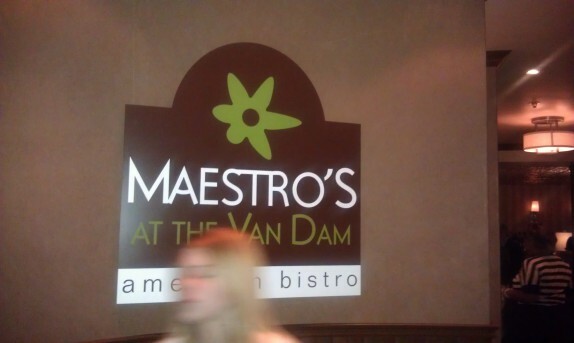 When we approached Maestro’s at the Van Dam, I had realized exactly where we were going. It’s the place on Broadway that has the crazy flame-looking things and patio in front. This isn’t a place that you go for a quiet date on a Friday night. This place was loud! Other diners were literally screaming at each other to have a conversation. It was the place to be, I guess. I had already figured out what I wanted my courses to be from browsing the menu online, but, for giggles, try to figure it out while I talk about the complementary stuff they brought to the table. 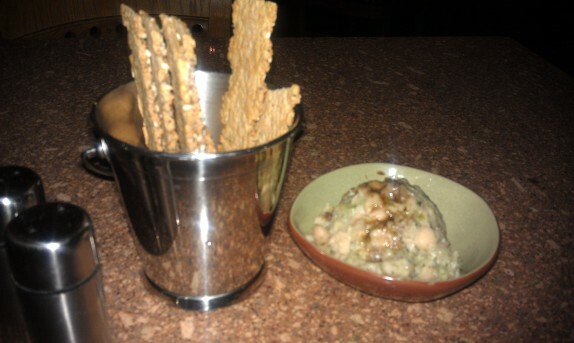 The first thing they brought us were crackers with a white bean and fennel puree to have with them. They weren’t just any crackers; they were like a flat bread covered with poppy and sesame seeds. Totally delicious; these things may be my favorite crackers in the universe. While we were working on that, the waitress brought over some bread with a butter that was topped with some Hawaiian salt. The butter was lacking in any real flavor, but the pinkish salt, when added to the butter, made everything whole again. The salt really helped make this an enjoyable appetizer to the appetizer. My appetizer arrived. 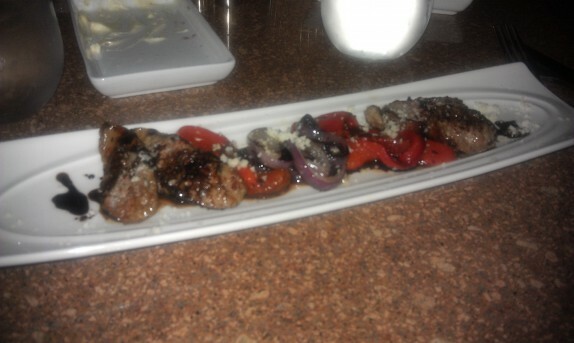 I had the Grilled Veal Sausage (Veal sausage with sun-dried tomatoes & fresh mozzarella, roasted onion and peppers, balsamic drizzle). This was pretty good. The problem with roasted peppers in a dish is that they tend to overpower everything else on the plate. That kind of happened in this case, as there were lots of roasted peppers, but with contrasting flavors like balsamic vinegar, and contrasting textures like the sausage and the cheese, this was interesting enough to enjoy. The sausage were grilled nicely and tasted great. For dinner, I really wanted steak, so I tried the Steak Frites (Marinated Harris Ranch Teres Major Steak, fresh frites, mixed greens, peppercorn dressing). I had to do some research on Harris Ranch before I went to the restaurant. It turns out it’s one of the largest beef producers in the US; they’re based out of California. So the lesson here is that even when a place names the source of their products, that doesn’t necessarily mean they’re locally sourced. But local, national, whatever, what was the quality like? Well, I ordered it medium rare. It did arrive at that temperature. Unfortunately, the meat was barely seasoned as it was cooked, so it lacked any crust and intensity in flavor that you would expect from grilling such a cut. The cut, teres major, is actually a muscle from the shoulder that is supposed to be as tender as tenderloin. Since the temperature was perfect, each bite was tender, but really would have benefited from some seasoning. The sauce, which was supplied in abundance, was very creamy, but also lacked some basic seasoning. I wasn’t going to dip the steak in the ketchup, so I added a little salt, which I never like needing to do. The frites were pretty standard. They were actually quite liberally seasoned. The salad was comprised of a mix of bitter greens. It was a nice accompaniment to the dish, as the salad usually is for this dish. For dessert, I really wanted the Strawberry Rhubarb Tart (served with Cinnamon ice cream), but, because it was a busy evening, I had to settle for the Lemon Cheese Pie (Chantilly cream, minted lemon curd). As it turns out, this was the high point of the meal. The cake was delicious. It was built upon a beautiful cookie crust and loaded with a slightly sweet but tart cream cheese filling. 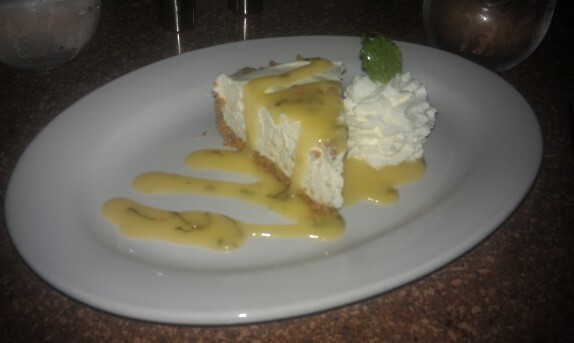 The lemon curd, which was perfectly applied, was spiked with mint and also had a contrast of sweet and tart. Each bite was refreshing and offered flavor and texture combinations that really sent this meal to the next level. I’m never as impressed with dessert as I was here. 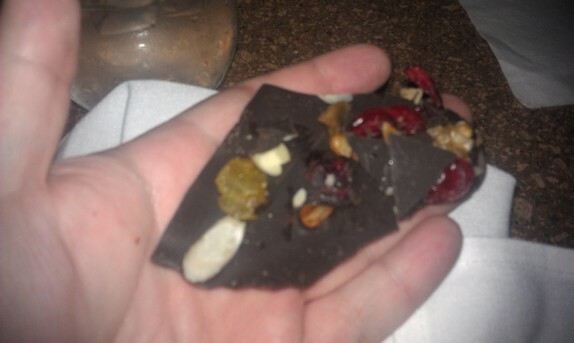 As we paid the bill, our waitress brought us a basket of a dark chocolate, mixed nuts, and dried fruit medley. I had to try a piece. It was also delicious! As I did my research for this restaurant, I noticed that the prices are normally a bit on the high side. 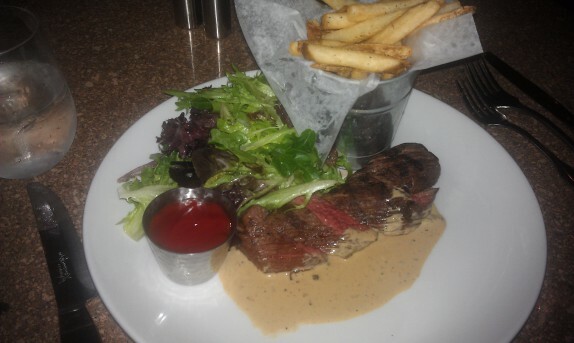 I am not sure if the portion would be the same size, but the steak frites dinner on the menu (same description as the restaurant week menu) normally costs $25. It’s a bit more than I’d like to spend for that meal, but there are worse places charging even more in Saratoga. Again, I don’t know if they do provide larger portions for the regular menu. I do know that my portion, even though it was underseasoned, was adequate and certainly well worth the price of admission for restaurant week. I guess I’m having more and more positive restaurant week experiences as I attend more. That has to be like the law of averages or something. Maestro’s has parking behind the restaurant although I don’t find parking in Saratoga to be a problem. Maestro’s fries are terrible, I always substitute their homemade tater tots for fries. Who am I kidding, I usually order some even if my meal doesn’t come with them. So good. 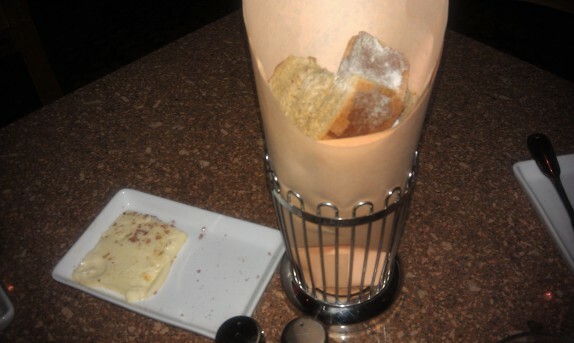 Other than the salt/butter, you didn’t mention the bread. Maestro’s bakes their bread in house and it’s excellent. Not many places bake their own bread. Obviously, I’m a fan. Maestro’s is one of my favorite Saratoga restaurants. Glad you got to try them. Mandatory clarification: I didn’t say the parking was a problem. I implied that it’s normal for there to be a quest for parking on Friday nights. I didn’t realize they had a parking lot, but we probably wouldn’t have parked there any way because we had something to do a few streets down afterwards. The tater tots sound awesome. I’ll have to try them next time. So what did Cassie order? I really enjoy reading your dining reviews but wish you would include what your companion(s) at dinner also had. Is there a reason you never really post on what Cassie had? I get that it’s YOUR blog and what YOU experienced but even just pictures of what she ordered would give a more balanced view of the whole meal and not just what you ate. I’ll admit it, I just want to see more pictures of food. There’s a bunch of reasons I don’t include what she ordered. The first is that I try to keep these as brief as something I’d like to read. Personally, when it comes to reading blogs, much past the 700 word mark, I’m already looking at something else; I imagine most everyone is similar in that regard. Additionally, I do put quite a bit of effort into remembering specifics about a meal; adding her meal into that for every place would really test my own memory, which, as an older man, isn’t getting better. There have also been (annoying) times in the past when people have taken issues with what she ordered, so for these three main reasons, unless there’s something notable about her experience or I try her stuff, I generally don’t include it. As far as the balanced view, while it would give more of an idea of what else happened at the table (and more pictures), her experience usually doesn’t ultimately factor into how I feel about a place walking out. [Exception: when places get cute and don’t list major ingredients in their dishes. An example of this is adding chopped tomatoes to the base of an omelette; not only is she allergic to tomatoes, nobody would ever expect to find chopped tomatoes in an omelette unless it was indicated on the menu. All that said, I believe she ordered the Crab cake, the rock shrimp rigatoni carbonara, and the lemon cheese pie.